More than 400 of 450 lawmakers in Russia's lower house of parliament, the Duma, backed the law on Tuesday. Soldiers' social media data has allowed open-source journalism sites like Bellingcat to expose secret military activity by Russian forces, sometimes in real time. 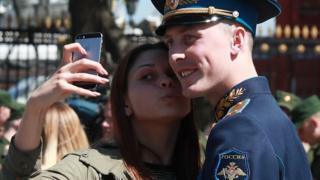 In recent years, social media posts by servicemen have revealed Russia's military presence in eastern Ukraine and Syria, sometimes contradicting the government's official claim of not having troops there. US military security concerns were raised when a fitness tracking firm showed the exercise routes of military personnel in bases around the world - including in Syria and Afghanistan during conflict time.